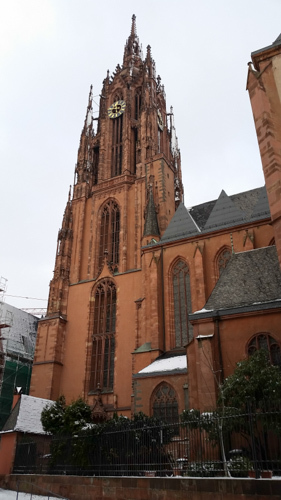 From there I went to the cathedral or Kaiserdom where the emperors from 1562 are consecrated and crowned at the crossing where the free standing altar stands. When you walk in, the porch shelters the only piece left from the 18th century baroque interior. 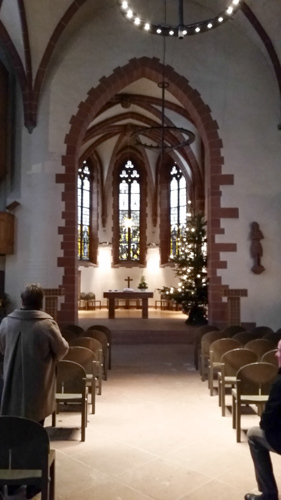 Today it is a lovely devotional chapel. 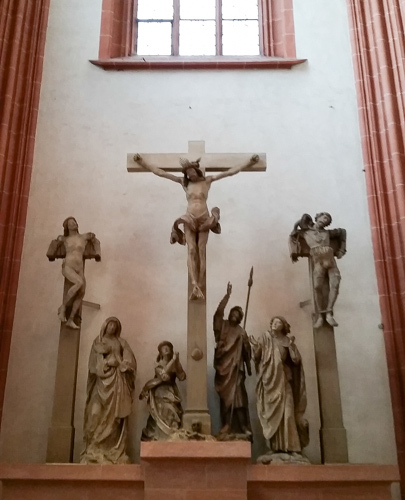 Then on entering the church to your left is a 1509 crucifixion by Hans Backoffen which makes a powerful statement of our hope in the Resurrection. 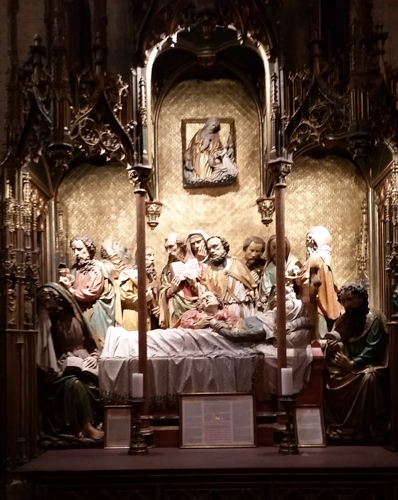 This scene is complimented by a beautiful 19th century Pieta in the chapel that houses the 18th century baptismal font. Walking a little further I looked to the crossing on the right and saw the organ. I planned to remain for the noon mass and thought I would hear the instrument. I was disappointed because it was not used however the congregation sang unaccompanied and it was stunningly beautiful. 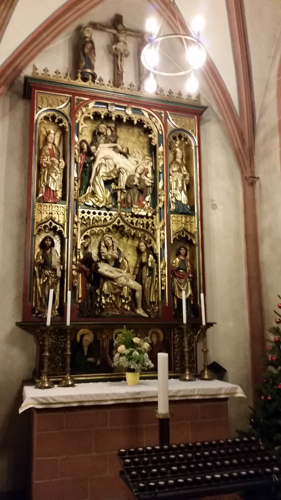 And the priest celebrated mass ad orientem at the magnificent high altar from the 15th century. 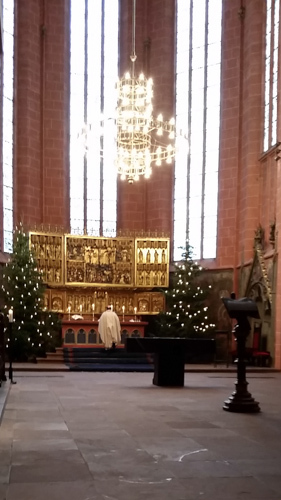 On the high altar is the Wahlkapelle where the the seven prince electors would elect the new emperor. 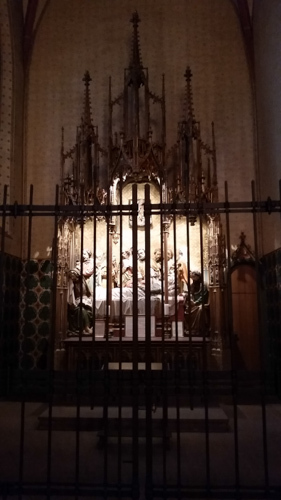 I did not take a picture because today it is a chapel for eucharistic adoration. 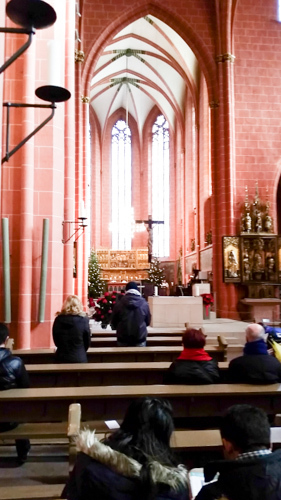 The church brochure requests that we pray before the Sacrament for justice and good politics in the world. The chapel is behind the Magdalene chapel. 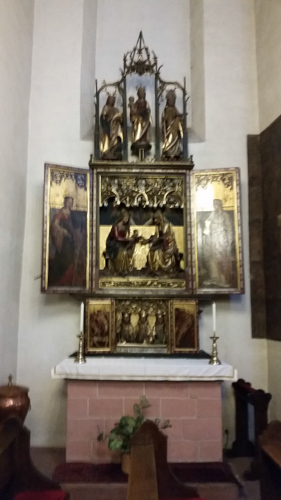 There are many 19th century Neogothic altarpieces, however there is one from the 15th century that depicts the Dormition of Our Lady. 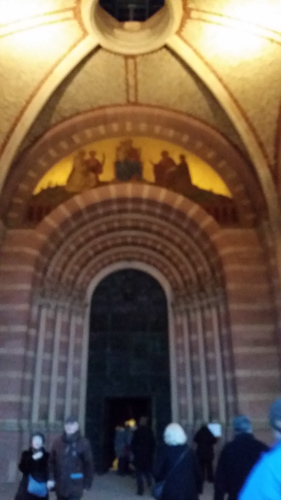 The cathedral was an invitation to linger and prayer through beauty to God and for me the crowning was Mass. 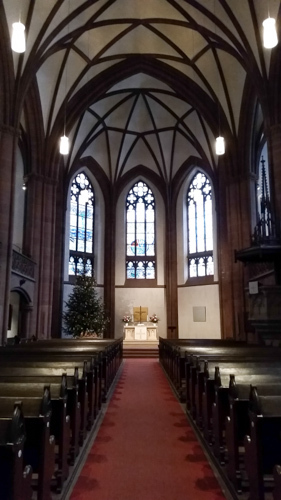 The church can just be a beautiful museum however when you experience the Mass it becomes what is was built for: that is, a house for the worship of God. 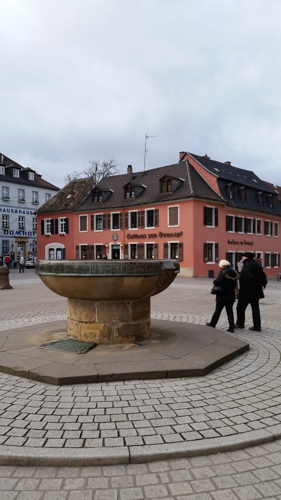 From there I went back to Romerberg to visit Nikolaikirche from 1290. 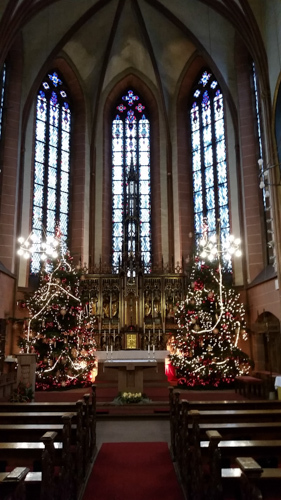 Today it is a Lutheran church that has many statues of Saint Nicholas. From there I crossed the river to continue my pilgrimage to two more churches. The first was the Church of the three kings from the 14th century. 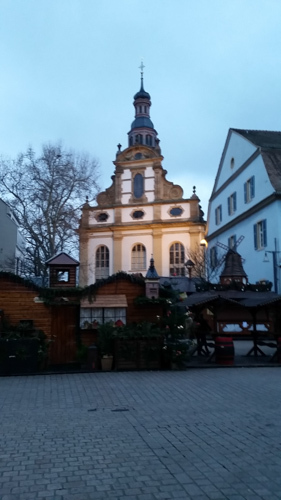 In 1531 this church joined the Lutheran Reformation. 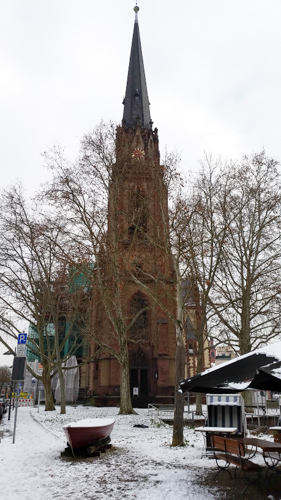 I had a strong determination to see the pulpit from which the pastor denounced the Nazi ideology and the church joined the Bekennende Kirche, that is the Confessional Church, a movement which opposed the national socialism of the Nazis. Such witness to the Gospel in the face of an evil that will murder you emboldens my faith in Jesus. Evil may murder the body but it cannot extinguish the freedom of the spirit of truth. 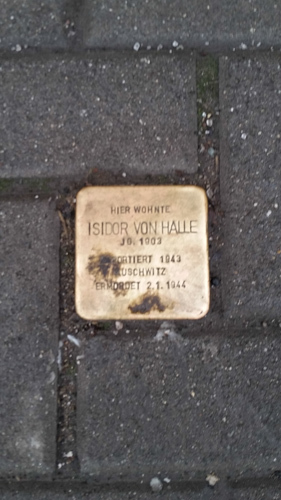 In the church I learned of Stolpersteine, that is stumbling stones, that are inserted into sidewalk pavement across Germany with the names of those Christians who were murdered by the Nazis. They are placed in front of their home. Over 40,000 in 800 cities have been placed over the past two or three years. 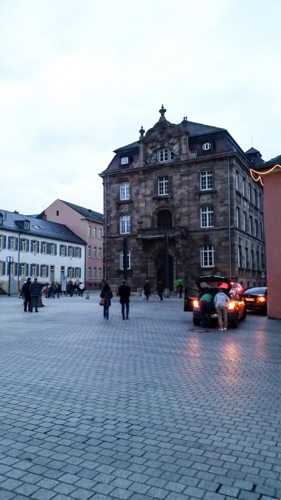 The stumbling stones called to mind all the memorials to so many people that opposed the Nazis and were even murdered for their witness to the truth for the sake of the Gospel. Their witness demonstrates the power of the Resurrection of Jesus. 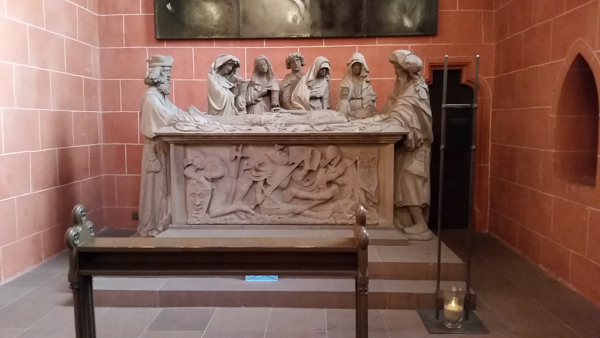 From there I walked to the Deutschordenskirche about I had read has the most beautiful nativity scene in Frankfurt. 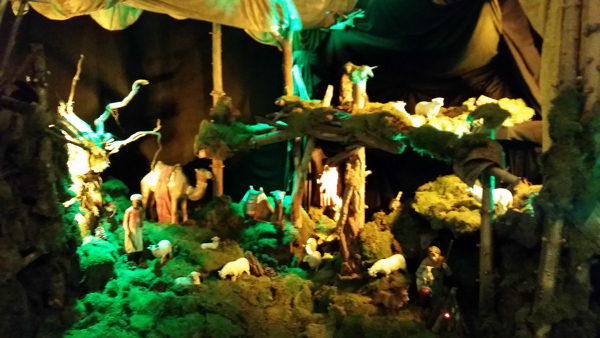 When I entered the church I turned around and the whole wall had been transformed into the nativity. 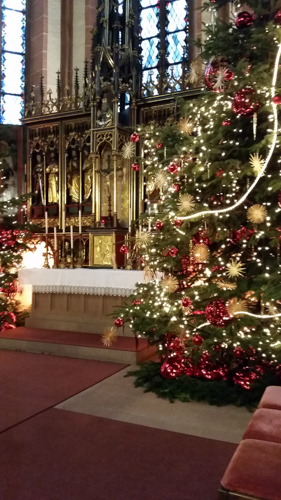 The scene is remarkable not to be out done by the festive high altar. The day was a day of pilgrimage from church to church in a city where church towers once dominated but are now overshadowed by towering buildings dedicated to commerce. As I was looking at all these impressive modern structures reaching into the sky my eyes just happen to look at the pavement and behold a stumbling stone. My heart and soul were overwhelmed. 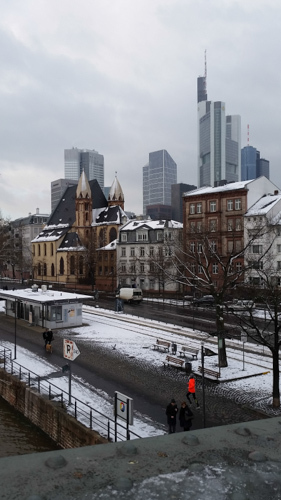 Did I just happen to stumble upon a srumbling stone or was it the the Lord’s way to sum up the meaning of my Christmas pilgrimage in Frankfurt? Today was profound. It was more than admiring beautiful churches reconstructed after the horror of war; rather, today unexpectedly revealed to me a truth in the lives of these believers. In the face of the untold suffering unleashed by evil people often say, “Where is God?” The answer is powerfully given in all these stumbling stones. 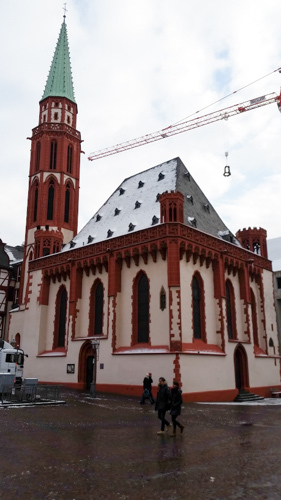 This entry was posted in Church Architecture, Europe, Faith, History and tagged Frankfurt. 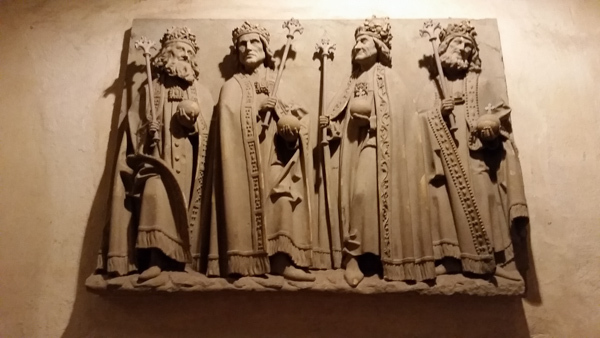 Christmas, Germany, Kaiserdom, stumbling stones on January 21, 2015 by frjfkauffmann. 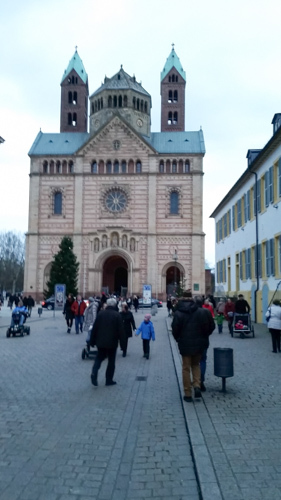 The Kaiserdom in Speyer (1030-1124) is the greatest Romanesque church in the world reflecting the medieval idea of a Christian empire. The book of Revelation describes the new Jerusalem as a city with three portals on each side with a total of 12 portals so the west facade has three portals. 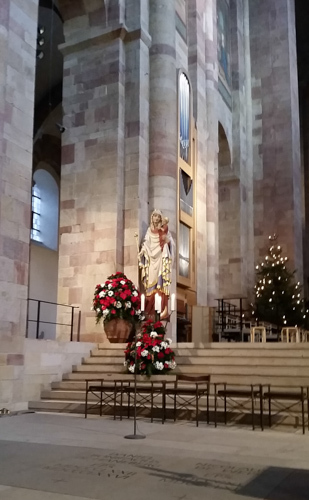 There are three figures above the portal as the guide brochure points oul: Proto-martyr Stephan as patron of the cathedral, Archangel Michael, patron of Germany, Mary to whom the Cathedral is dedicated, John the Baptist since the cathedral is the main baptistery and Saint Bernard its most famous visitor (1146). Over the portal is the rose window with Jesus in the middle as the center of creation and the fulfillment of human life. The porch. Although three are three doors to the porch there is only one door into the cathedral. It is like the narrow gate. Above the door is written: “May they all be one!” The cathedral was the last important church to be built before the schism of 1054. 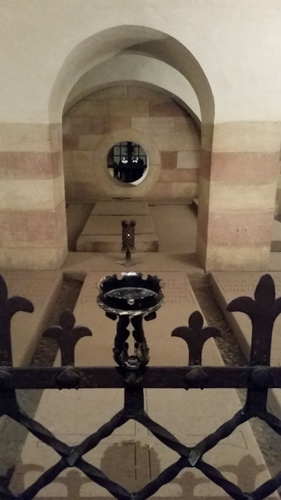 The crypt is the oldest part of the cathedral. When you enter a deep silence penetrates the soul. The rhythm of the columns and the light still the soul. 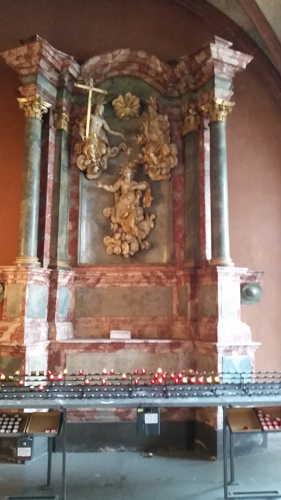 The altar in the crypt contains 7 altars and a main altar. 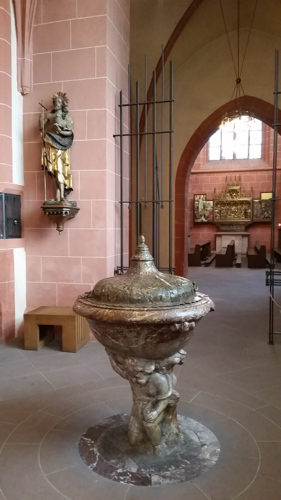 The baptismal font is hewn from one stone and is the oldest font north of the Alps. 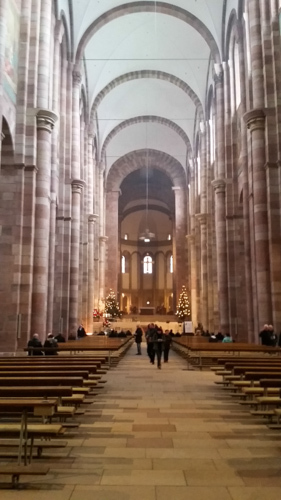 The Central Nave. 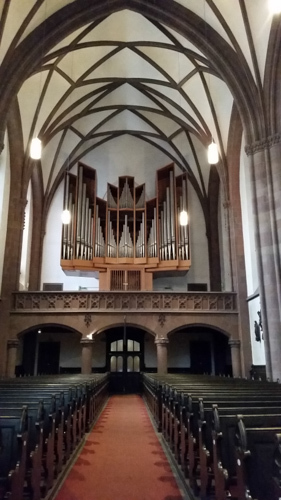 When I walked in, the nave overwhelmed me although it is devoid of ornamentation which gives it a clear direction. 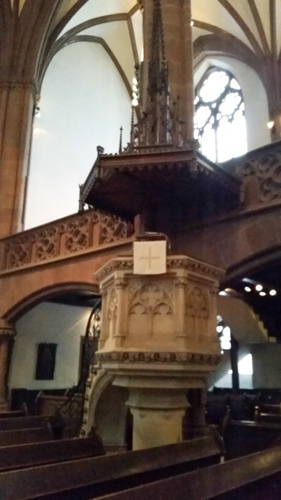 There is no distraction but the believer is led directly to the apse. There is a subtle symbolism in that there are 12 pillars on both sides symbolizing the church is founded on the witness of the 12 apostles. The nave has 6 vaults symbolizing not only the heavens but the six days of creation. 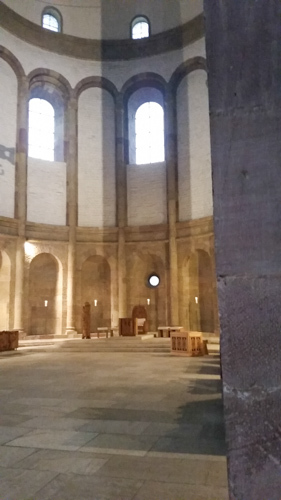 When I began to walk down the nave I noticed on the floor: O Clemens. 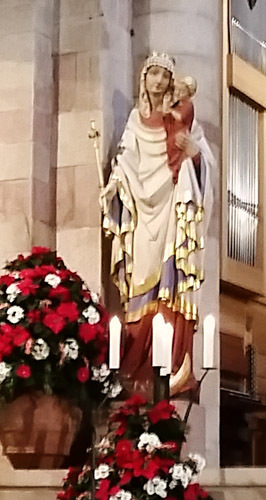 Then I noticed O Pia then O Dulcis Virgo Maria. 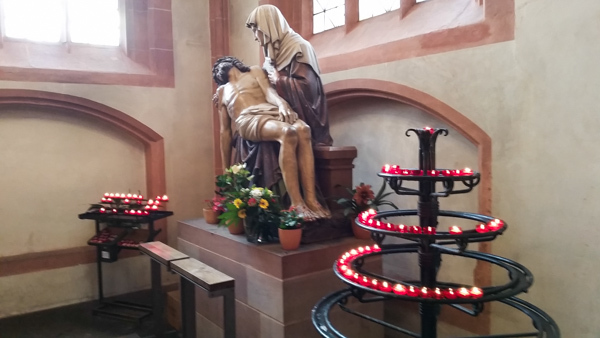 I began to chant the Salve Regina in my mind which lead me to look up to the left, and the Virgin welcomes you to the choir. Later I learned Saint Bernard of Clairvaux added these words to the Salve Regina when he visited the cathedral. 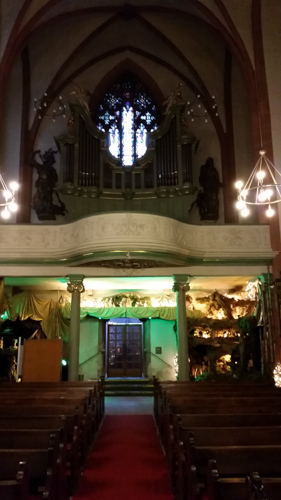 The choir and apse. The symbolism of the cathedral is evocative. The cupola symbolizes the seventh day but is given an octagonal shape to symbolize the eigth day of the Lord’s Resurrection and under the cupola is the altar. When turn to the west you walk into the burial places of the kings and emperors of the Salian dynasty. The guidebook provided a profound invitation to pray today for those who have political responsibility to the welfare of society amd peace. The bowl in front that is filled with wine when a new bishop is installed. 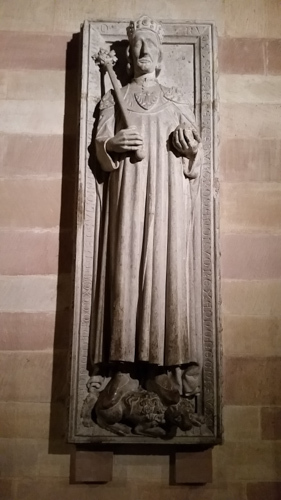 This entry was posted in Church Architecture, Europe and tagged crypt, Kaiserdom, Speyer on January 15, 2015 by frjfkauffmann.